Our bus got us in to Ulaan Baatar, the capitol of Mongolia, the weekend on which the entire city broke out in celebrations. 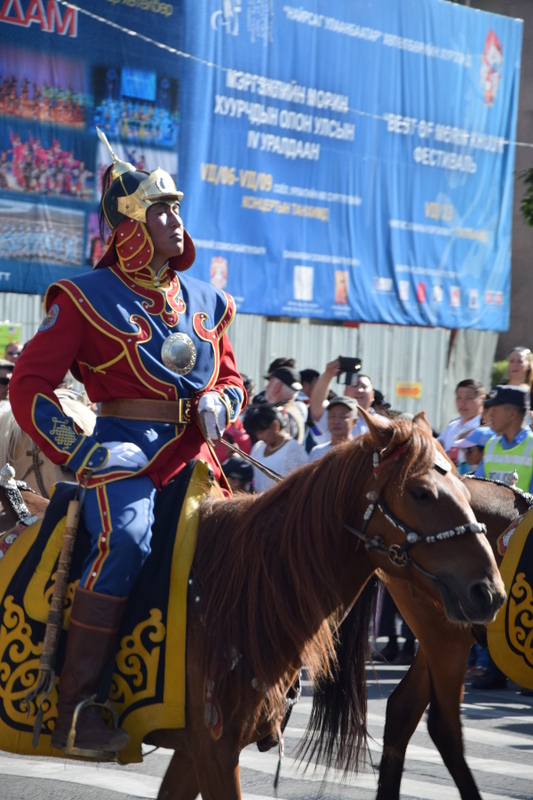 It is the annual ‘Naadam Festival’, a kind of national Olympics, in which competitors compete in wrestling, horse riding, archery, and a sport called ‘knuckle bones’. The sport events take place over three days, with many cultural, musical and art events taking place at the same time. Our arrival itself was eventful. The bus dropped us off at a different location than we were expecting, and this resulted in us having to organise (and haggle) a taxi ride into the centre. It was quite a shock when we, for the first time on our journey, had not even a few words to communicate and explain where we wanted to go, or how much we were willing to pay. In the end we were successful in our incompetence, and the taxi took us for a cheaper price simply because it looked like we were about to get into a different car. 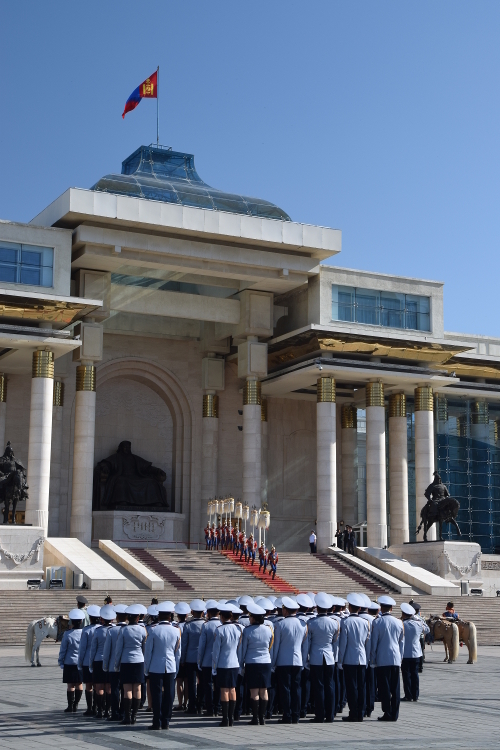 The ride revealed that the Mongolian capitol is completely different from the other cities we had met. Moscow, for instance, is built entirely in a circle. Ulaan Baatar is built along one straight road. The roads are wide but the buildings fairly low, the Soviet influence obvious, but not dominating. Like in Russia, the side roads are countless, often unmarked, and every building seems to have endless, identical doors, making finding things (like our hostel) somewhat tricky. Helpfully though, some Mongolians seem to speak perfect English. As we walked around, confused by a map that another traveller we met in Ulan Ude had drawn to help us, a couple stopped and took the time to talk to several people and walk around several buildings in order to find the right entrance, while also kindly enquiring about where we were from and how our journey was. However there is plenty different, too. Like the fact that no matter which way you turn you will likely be able to see a glimpse of the hills on either side of the city. The people, faces, clothes, and monuments also all hint at how different this country is from Russia, even though the countryside merged in an easy transition from grassland to grassland as we drove through it. 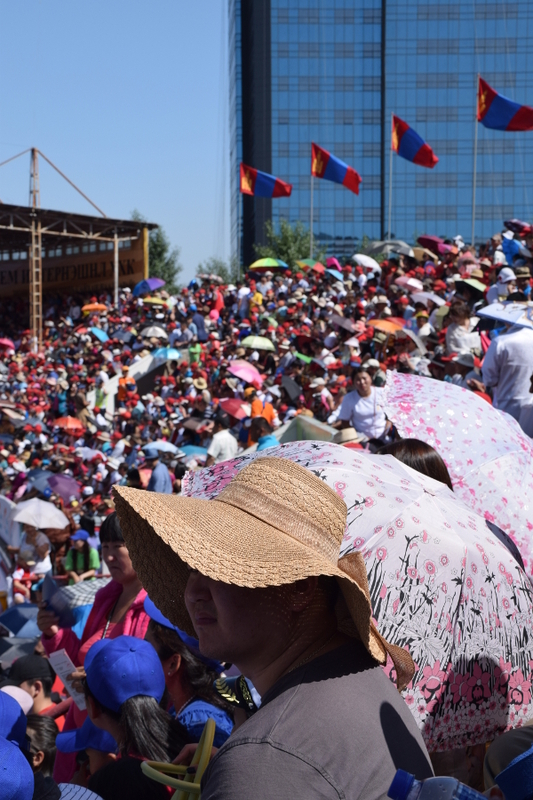 It is likely that our timing emphasized these differences, but many Mongolians were walking though Ulaan Baatar wearing traditional dress and fancy hats, posing for local and tourist cameras alike. The music that played over loudspeakers on different squares had its own distinct flavour and sound, even when you cannot understand the lyrics. Luke and I were both impressed by the city in it’s celebratory glamour. The bright colours and the unique cuts of the clothes, and the extravagant jewellery never stopped amazing me. On the day of the opening ceremony, we admired the costumes of the national guard in their bright red and blue, their shining silver helmets reflecting in the sun. They suffered in the ever increasing heat, I imagine, as temperatures rose to 35 degrees Celsius and the uniforms seemed multi-layered and heavy, but they bore it with extreme dignity. Not even the horses seemed to put a foot out of line. While the events themselves are interesting- wrestling here is unique because the competitors are allowed to move around far more and because the size of the competitors makes it look more similar to sumo wrestling- the people watching is also amazing, and took up most of our time. There are countless market stalls where one can watch young and old tuck into local delicacies or even try them. There are few vegetables on display, yes, but grilled skewers and deep- fried squashed dumplings (or as we named them ‘Mongolian Burgers’) are everywhere, and incredibly delicious. Walking along the streets, sun warm on our backs Luke said simply, “I think I’m going to like Mongolia”. I think so too.